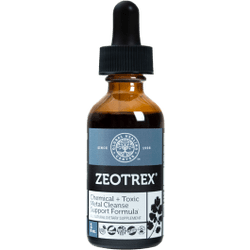 Zeotrex is a blend of powerful herbs that help rejuvenate vitality, energy, mental clarity, and overall health by encouraging detoxification of harmful chemicals and toxic metals. Zeotrex is an all natural formula used to aid the body in the removal of chemicals and metals. It was developed using proprietary technology that incorporates the chemical and toxic metal cleansing ability of zeolites with powerful herbs that attract and eliminate chemicals and toxic metals. The history of Zeotrex is based on our Spagyrex® process, which was invented during Dr. Group's research into the origins of good health. He found that all disease begins when the body becomes contaminated with toxins and its internal self-healing mechanism is suppressed. These toxins come from air, food, water, beverages, harmful organisms, stress, chemicals, toxic metals, radiation and many other sources. Thus began a journey to create the most powerful herbal chemical and toxic metal cleanse product available. It started by studying the works of the famous 16th century healer, scientist, and alchemist, Paracelsus. The Spagyrex® process is a revolutionary, multi-step, proprietary alchemy and spagyry-based processing technique that follows the principle of separating and recombining all the elements of an herb to extract the most powerful essence of its healing nature. This results in a Harmonious Organic Supercharged Extract. What are the Top 5 Reasons You Need Zeotrex? Detoxification of chemicals and toxic metals is important for maintaining good health. Great for maintenance or as part of the complete chemical and toxic metal cleanse. Cleansing your body can increase your enzyme activity and help your body work better. Toxic substances are everywhere. Fish may contain metals, vegetables can contain pesticides, deodorant contains aluminum, water may contain industrial chemicals. Avoiding them all is nearly impossible. Cleansing is the only answer. Zeotrex contains powerful ingredients, has never been tested on animals, and comes with a full, money-back guarantee. You have nothing to lose! Only product on the market featuring a Spagyrex® processed blend of powerful herbs. Sustainably produced in the USA with organic and wild cultivated herbs. Vegan safe and GMO free. Kosher and Halal approved. Does not contain harmful fillers, binders or additives. Metal toxicity rarely comes with warning, indications are often nonspecific and undiagnosed until serious problems develop! The Environmental Integrity Project, and Sierra Club listed Pennsylvania (arsenic and lead), Ohio (mercury and selenium), Indiana (chromium and nickel), Kentucky (arsenic), and Texas (mercury and selenium) as the worst states for air pollution.